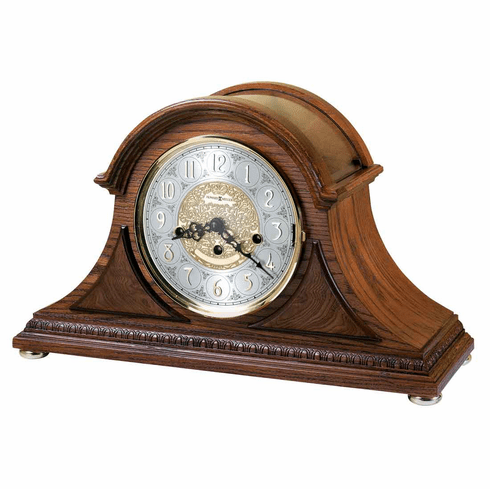 Finished in Oak Yorkshire on select hardwoods and veneers, this tambour mantel clock features decorative egg-and-dart molding that wraps around the base, and rare olive ash burl overlays accenting the front. An arched glass top allows a view of the intricate solid brass clock movement. The dial features applied Arabic numerals and chapter ring with a polished brass finish. Four brass finished feet support the clock. A high-precision, German-made, Kieninger key-wound, Westminster chime movement plays 1/4, 1/2, and 3/4 chimes accordingly with full chime and strike on the hour. An industry exclusive duel-ratchet winding arbor ensures safe movement winding. Chime silence option and durable bronze bushings. Designed and Assembled in the USA.